"What are this year's Black Friday software discounts and deals?" 70% discount on VIPRE Antivirus + Antispyware - when Black Friday ends, so does this offer. Get antivirus and antispyware protection for only $9.95 today only. Includes identity theft protection and anti-rootkit technology in addition to important protection from virus and malware outbreaks. This is the same company that makes top 5 rated Sunbelt Personal Firewall. You won't find any other commercial antivirus package at this price, so get VIPRE Antivirus + Antispyware for $9.95 before the offer expires at Midnight on November 27, 2009. Save 15% on TrustedID Identity Theft Protection Get 15 + Points of Protection from TrustedID, including their $1,000,000 Warranty, Lost Wallet protection, Medical Benefits monitoring, Fraud Alerts, and full-family identity protection for a 15% discount. 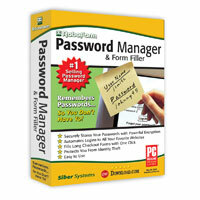 Roboform Password Manager - 33% Discount. Roboform is the password manager I strongly recommend, so it's great when I can offer a way for people to save money on it. With RoboForm password manager, you remember one password, RoboForm remembers the rest. RoboForm memorizes and securely stores your online and offline passwords, so you will never forget them again. Enjoy easy, one-click logins to your online accounts. Save time by completing online registration and checkout forms with one click. RoboForm gives your passwords and other personal data extra security (strong encryption provided), portability, and complete manageability. You can save 20% on Roboform using coupon code ROBO-VMWX-THRT. The Roboform discount expires December 7, 2009. 30% Off Dragon NaturallySpeaking 10 Preferred when you use coupon code: giahh897e. Create documents, reports and e-mails three times faster than most people type -- with up to 99% accuracy using NaturallySpeaking 10. New Dragon Voice Shortcuts collapse common tasks into simple voice commands. You can even dictate into a handheld device when you're away from your PC, or use a Bluetooth microphone. Supports both 32-bit and 64-bit systems. This offer expires 11/30/2009. 30% Off PDF Converter Pro 6 using coupon code: j2bm26xoo PDF Converter Professional 6 provides PDF creation and editing for home and business users at a fraction of the cost of buying Adobe Acrobat. It provides everything needed to create, convert, and edit PDF files. This offer expires 11/30/2009. Buy Creator 2010 Pro and USB Capture Device and SAVE $60 Instantly. Basically this discount gets you the USB capture device for free when combined with the purchase of Roxio Creator 2010 Pro. The software includes video editing, photo editing, music editing, CD/DVD burning and a bunch of other features to help you manage your media. Offer Expires December 1, 2009.